Some dog beds are incongruous and catch the eye in an unpleasant way. Couches and sofas are often better looking than a regular bed for dogs. Some of the best dog sofas out there are very functional, stylish and blend in with home décor. They're more elegant than a traditional dog bed. Dog sofas and dog chairs are also more comfortable and easier for pets with sore joints and muscles. If you want your canine to sleep in the lap of luxury, a dog sofa is what you're looking for. I'm not talking about a large piece of furniture that's going to take up a ton of space in your living room. Dog sofas and chairs are specifically made for our canine companions, and they're just their size. * Click on the best dog sofas for more information and prices, or scroll down below for more details. I recommend listening the above podcast, where our Editor-in-Chief Samantha talked with one of dog beds industry leaders on the proven health benefits of dog beds for our pets. The difference between dog beds and dog sofas or chairs is minimal. The primary reason a pet owner may choose a pet sofa or pet chair over a traditional dog bed is the design and style of pet sofas and couches. Dog sofas are simply more stylish and better looking, while dog beds will often be focused more on functionality and chew-proof points. Nevertheless, there are options that offer the best of both worlds. You can find orthopedic dog sofas and dog chairs with large cushions, high backs and comfortable sides that are also well-designed, but they're rarely cheap. They provide dogs a comfy place to snuggle in and snooze without shedding hair over your furniture. They will likely to make your pup feel like a prince, if he can appreciate luxury. While not a rule, the best dog sofas will often be less expensive than dog beds but provide less functionality as well. If you don't mind hiding your dog's bed and prefer him to have a more ergonomic sleeping pad, then a cheap dog bed or an indestructible dog bed is what you're after. But if style and design is important, a dog chair or sofa is perfect. In the below list of best dog sofas, we picked the best of both worlds: something that is stylish enough yet ergonomic and functional. Most of these sofas for dogs are orthopedic and made of high quality materials by manufacturers with great industry reputation. Most of these are best for small to medium dogs; for a large dog, look into Big Barker dog bed. Now check out what we have on the top of our list. This large pet lounge from PetFusion measures 36”x28”x9” with authentic 4-inch memory foam and polyfill side bolsters. Two other sizes are available. Placed in one corner, this sofa would be your dog’s sanctuary. It’s so smartly designed with neutral colors, so it won't clash with your décor or theme. The covering fabric is water resistant and washable but, according to buyers, not the really thick kind. Replacement covers can be bought separately and that’s a good solution when the cover needs to be washed or when it’s torn. The base of the PetFusion Ultimate Pet Bed & Lounge in Premium Edition is non-skid and is ideal on any floor surface. This is one of the best dog sofas as it is made with top-quality, high-density memory foam that’s not only superbly relaxing, but conforms to the unique shape of the one sleeping on it. For those with arthritic or senior dogs, this has even become more of a necessity than mere luxury. Even dogs know the difference, and their humans feel that they’ve invested wisely on this dog lounge. Donate that unsightly pet bed and perk up your home with one of the best dog sofas from Enchanted Home Pet. This upholstered pet bed measures 33.5”x21”x12.375” and has cushioned sides and back. It is elegant-looking with its deep dark brown color and decorative tufts and brass nail heads. It comes with a 21”x15” cushion to give pets the luxurious comfort of a sofa. Dirt and stains can be cleaned off with a damp cloth. This dog sofa is ideal for pups weighing 30 pounds or less. Four 2-inch wooden feet support the sofa. Unlike most dog beds that sit flat on their base, this one has legs that lift it off from the floor. Home owners like this feature, including the Enchanted Home Pet Brisbane Tufted Pet Bed's faux-leather material, because it has become easier to blend with their existing furniture and interior theme. Pet owners found this to be what they’ve been looking for as a bed for their pets, not only for dogs but also for their cats. It was obvious pets felt good sleeping on it and their owners could only guess how comfortable the sofa was. The excellent padding, perfect design and posh look make it definitely worth the price. Here’s another classic from Enchanted Home Pet, complete with covered buttons on tufts and decorative brass-tone nail head across the front of the base. This time it’s beige and quite large at 40.5”x30”x18”. With a sitting area of 30”x22”, there’s enough room for a 70-75 pound pooch. The cushion on this dog sofa has a removable and washable cover, while the rest of the sofa can be spot-cleaned with soap and damp cloth. The bed stands at 2 inches off the ground on four sturdy wooden feet. Most buyers found the Enchanted Home Pet Ultra Plush Library Pet Sofa a bit puffy when it arrived but noticed that it soon settled to a very nice thickness that remained firm. It didn’t sag and seemed to conform to their pet’s shape instead. The sofa took the place of formerly dowdy couches, and both pets and humans are proud of their new acquisition. Dog owners observed that the sofa has ample space whether your dog loves to curl up like a ball or stretch out like an eagle spreading its wings. The cushion has fastenings to secure it on the sofa’s base, so it stays in place and will spare you the trouble of putting it back every time your dog gets off or moves about. A few pet owners who bought this expecting it to be one of the best dog sofas were disappointed with the weak support bracing underneath the bed. They claim it broke after just a few uses. If you’re looking for a pet bed that’s both snuggly and cool, then check out this quilted couch from Serta. This dog couch is made of egg crate foam and the textured surface of this material allows for better ventilation for your pets. The bed measures 34”x24”x4” and has supportive bolsters along its three sides. The fleecy quilted cover adds coziness. This pet bed is available in colors of mocha and tan. Pet owners were impressed with their purchase. They say this is one of the best dog sofas and exactly what they expected it to be – large, comfortable, and great quality in both construction and materials used. Some even reordered for their other dogs upon seeing the actual product. The Serta Orthopedic Quilted Couch also turned out to be the perfect bed for elderly dogs and those with hip problems – absolutely no need to “climb” to bed to sleep. Dog owners particularly liked that this is not furniture-like and is more of a relaxed style. Some creative pet parents discovered that they could arrange two of these beds facing each other and have two or more of their pets snuggle together. This is a highly portable bed, which makes it ideal for taking along on trips. You’ll find this relatively lightweight and easy to move around from one room to another where your dog might want to sprawl. Do you need help getting your pet off your bed or your sofa? Then the Simmons Beautyrest Colossal Rest Orthopedic Memory Foam Dog Bed might just be what you need. 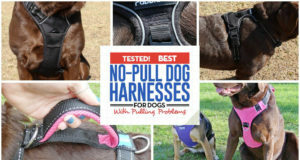 This type of foam conforms to the dog’s body shape and provides superior support. The mattress is covered with a plush material that adds to the comfort and luxurious feel of the bed. The rest of the bed is covered in either corduroy or jacquard material. Five color combinations are available, and you may choose from small, medium and large sizes. The medium size measures 36”x26”x7” with a sleeping area of 31”x23”. Buyers claim the Simmons Beautyrest Colossal Rest Orthopedic Memory Foam Premium Dog Bed is one of the best dog sofas because their dogs with arthritic pain have benefited greatly from sleeping on it. The soft cushion sinks a little with the dog’s weight, while the sturdier perimeter and walls maintain the shape of the bed. This makes for a cocoon-like bed which results in better sleep. This is one of the best dog sofas, though it tends to run small. Buyers recommend measuring carefully before placing an order. Not all dog beds are created equal and not all dogs have the same needs. So, if your dog has a special need for a memory foam bed, this is definitely a good choice. It’s not only for sleeping, it’s also for relieving pain associated with bone and joint disorders in dogs. Dogs may want to curl up and snuggle every now and then, but they’d love it more if their bed allowed them to also sprawl and stretch. Now here’s one really large bed from Caddis for that hefty mutt you’ve got! It measures 54”x34” with a 3-inch thick foam for the bed bottom. It has fully-packed bolsters on all three sides which uses hypro-loft poly-fiber filling for a comfortable and firm support. The Sherpa cover of the Beasley's Couch Dog Bed is removable and washable. Dog owners say that their pets took to the bed right away – no coaxing or encouragement needed. It actually proved to be the most peaceful way to keep dogs off their master’s bed. There were some complaints about the cover material shrinking after a wash. A buyer observed that the material was designed to be extremely tight so that by overfilling it, it would be sturdy and continue to hold its shape nicely. The contents and padding are just a little difficult to put all back into the bed cover after every wash. Many pet owners have used this as one of the best dog sofas for years now, and they say that it’s holding up well. This might not be one of the best dog sofas with the biggest sleeping or sitting area, but it may well be the most charming. Another option from Enchanted Home Pet comes in two styles – the Black Basket and Pebble Brown – both elegant yet each distinctly beautiful. The Black Basket style has basket weave exterior and velvety cushion. The same plush material is used for the inner wall of the gracefully curved back and side support. This extends to the front and very slightly encloses the pet. It measures 26.5”x16”x16”. The Pebble Brown style has faux leather exterior and the same velvet material for the interior. This is obviously a lounge bed for the smaller breeds – dogs weighing 10 pounds or less. According to pet owners, this is their smaller pets’ favorite spot when they want to snuggle and curl up. They believe it is because the Enchanted Home Pet Ultra Plush Snuggle Bed kind of envelopes them. The slight curve to the front keeps sleepy pets from falling over without preventing an arm or leg to lazily hang through the front access. That this is one of the best dog sofas is undeniable – it even makes for a great conversation piece. But, dogs don’t know that. All they know is that it is soft and comfortable, and the best place in the house for them to sleep. It even has a pocket in the back where treats and toys are stored! Next articleMobic for Dogs 101 (Meloxicam/Metacam): Can I Give My Dog Mobic?